Star Trek: Voyager is the fourth series of the popular Star Trek saga. The starship Voyager is sent into the Badlands to find a Maquis ship. But Voyager gets transported 70.000 light years to the other side of the galaxy. There the combined crew of Voyager and the Maquis ship must try to find the way back home. Kes was a difficult role to cast. According to Michael Piller: "To find someone who could bring both an attractive intelligence and performing skills. We read a lot of people for that part, but when Jennifer Lien walked into the room, she was just 19 years old. No one ever saw this character as a 19 year-old. In order to get the maturity and intelligence, you have to find somebody who has lived a while. Jennifer had this deep, throaty voice and eyes that seemed to have all the knowledge of man in them, and it was just, "Wow!". We knew from that moment. We had more trouble finding her hair than we had the actress." Near the end the choice was between two actresses, Jennifer Lien and Jennifer Gatti (Libby in Non Sequitur). But the final choice is clear. The Ocampa are humanoid lifeforms, they look like humans except for their ears. Their internal organs haven't yet been described, but they have two lungs and their blood is red. The Ocampa most likely have mammary glands, just like mammals on Earth. The Ocampa possess paranormal capabilities. It used to be highly developed but has now lapsed through lack of use, but they can still perform telepathic conversation. The former abilities are not completely lost since some Ocampa have been able to increase their telepathic abilities by training. The individual life span of an Ocampa is about nine earth years. The Ocampa grow up pretty fast and are capable of taking care of themselves before the age of one. Between the ages of 4 and 5 the female Ocampa enters the Elogium, when the body prepares itself under impregnation. In the early stages of the Elogium a mitosis sack begins to form, its function is to house the fetus. The mitosis sack is located on the upper part of the back. Later on the epasafor appears in the palm, but it makes the mating bonding possible. The conception must occur within 50 hours after the epasafor appears. Before the bonding begins the female must go through a ritual called Rolisisin. The ritual involves that one of her parent has to massage her feet until the tongue begins to swell. The stimulation to the sympathetic nerves (that control secretion from exocrine glands) in the foot sets of a hormonal reaction. Which activates glandular activity in the tissues of the tongue and makes the tongue swell. After the Rolisisin the couple bond and must stay bonded for 6 days to insure conception. It is not known how long the pregnancy lasts. The Ocampa couples have an interesting relationship. They choose a mate for life and don't distrust or feel jealous about each other. The Elogium happens only once in every Ocampa's life so it's logical to assume that they give birth to many offspring at once, otherwise the Ocampa population would decrease with each generation. The Ocampa homeworld is a former M-class planet and the 5th planet in a G type star system, in the Delta quadrant. The Ocampa were once a flourishing peaceful civilization that lived on the surface of the planet. But over a millennium ago a group of sporocystine life forms, called the Nacien, from another galaxy were exploring the Milky Way and went through the Ocampa star system and inadvertently destroyed the ecology of the Ocampa's home world. Devastated by their doings they decided to leave two of their kind behind to take care of the Ocampa. The sporocystine life forms drilled a hole into the planet and created a subterranean city for the Ocampa, about 3 km below the surface. The sporocystine life forms left behind moved into an array close to the Ocampa home worlds star system and saw to the Ocampa needs; energy, food, water and recreational. They also raised a subterranean barrier to protect the Ocampa from danger. The Caretaker kept on over protecting the Ocampa on the home world, so their paranormal capabilities have now lapsed through lack of use and their individual life span is very short. The Ocampa on the home world consider the Caretaker a godlike figure that should not be questioned, but the Ocampa on the array do not. However a group of Ocampa's has questioned the way they live and have moved from the city and began growing their own food. Some have even gone up the ancient tunnels to the surface, which is thought to be against the Caretakers will. When the Caretaker knew his time was almost over he began to search the galaxy for a life form that he could use to create an offspring, so it could take over as the Ocampa's protector. But his mission failed so in a last resort he increased the energy dosage to the Ocampa home world so they had enough energy to last the next 5 years and sealed off the ancient tunnels and energy conduit, to protect the Ocampa from their enemies. Finally he tried to destruct the array but failed, but Voyager granted his wish by destroying the array with Tri-cobolt devices. The latest informations about the Ocampa homeworld are from SD 48315.6. The Caretaker had died and the Ocampa had enough energy to run the city for 5 years, after that it's up to the Ocampa to find a new way to power the city. The surface of the Ocampa home world and surrounding space is occupied by the Kazon Ogla, a warrior race who use the planet to mine ore.
Kes was born on the Ocampa home world in the year 2370. Her father, Beneren, was one of the greatest figures in her life. She was encouraged early on by him to question her people's belief and Kes believed he shaped the person she became. She had just turned one year old when he died. Shortly after that she went up the ancient tunnels to the surface but was quickly captured by the Kazon Ogla and made a servant. There she met Neelix, a Talaxian trader who was conducting business with the Kazons. They fell in love and Neelix promised Kes to get her of the planet. Their dream came true when a starship came across Neelix's way and offered him water if he would take them to the Ocampa. He took them to the Kazons on the Ocampa home world and by causing a scene was able to get Kes transported to Voyager. Kes agreed to help get Kim and B�Elanna from the Ocampa City. After a successful mission, Kes and Neelix convinced Captain Janeway to let them stay on the ship. Kes was curious, cheerful and eager to learn as much as possible. She was a dreamer, always seeing the best in everything and everyone. These qualities made her mingle well with the crew. Kes seemed drawn to the outsiders. She was one of the few friends Paris had. Their friendship caused some tension between Neelix and Paris, since Paris got attracted to Kes. But Kes was totally devoted to Neelix, the Ocampa way, so Paris realized he had no chance at her and finally he and Neelix made peace. Kes formed a friendship with the Doctor and seems to be the only crewmember who has had a relationship with him. Most of the crew look at him as a simple holo projection made to serve the ship. Kes, on the other hand, believed there was more behind his program then that and she stood up for him many times. The Doctor had been teaching Kes medicine and she tried to teach him how to behave with the patients and even diplomacy. When Kes wanted to hone her telepathic abilities she went to Tuvok. He became her mentor and she compared him once with her father. Kes and Neelix were lovers, but the peculiar thing is that they lived in separate quarters. Neelix totally adored Kes and got really jealous when she even talked to other men. This jealousy caused many quarrels between them and pushed their relationship to the extreme. They finally broke up, making Kes one of the few Ocampa whose relationship breaks up. After being 3 years on board Voyager, Kes's psychokinetic powers got so powerful she couldn't control them anymore. Kes began to destabilize at the molecular level and to avoid Voyagers destruction she took a shuttle and left. She eventually became a being seemingly comprised of pure energy. Kes's main job on Voyager was being the medical assistant in sickbay. She was the only living member of the medical department and therefore an important member of the crew. When the EMH (Emergency Medical Hologram) couldn't leave sickbay, Kes took care of the medical emergencies in other locations on Voyager and on away missions. She took part in numerous away missions, mostly because of her medical knowledge but also because of her Kazon expertise. She even had permission to use type II phasers during away missions, which is not common among Science/Medical crewmembers. She studied medicine and was most likely a quick learner since the Ocampa live for only nine years but can still run a whole city. Kes spent most her spare time in the hydroponics bay, a converted cargo hold. There she grew decorative flowers and food for the crew, because the crew's replicator rations had been diminished to save the ships energy. Kes had also shown potential in other fields. She had been taking shuttlecraft lessons from Paris and done quite well. She knew the way around the ship computer since she added 2 more hours to the Doctors holographic flu simulation, without him knowing about it. 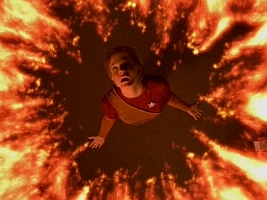 Kes even managed to save Voyager by opening a symmetrical warp field to create a resident burst that freed Voyager from the Botha. Kes had, as all other Ocampa, the ability to perform telepathic conversation, but probable not with other races like the Betazoid can. However she had been able to increase her paranormal abilities. With some help from Tuvok she could listen to other peoples thoughts and Tanis taught her how to use her psychokinetic power, so she was able to manipulate matter and life. Her paranormal abilities also helped her fight against the Botha, a powerful telepathic being. It's not yet known what kind of powers Kes has after her transformation. But she managed to propel Voyager 9,500 light years towards earth, completely circumventing Borg space, so she has most likely become very powerful. Jennifer's last Voyager episode was "The Gift", second episode in season 4.